This can result in serious injuries and the litigation that accompanies those injuries. In this case, it may have been truck drivers or other outsiders who stacked the pallets wrong – another thing you have to watch. While there is no specific OSHA code pertaining directly to vertical pallet stacking, inspectors can and do cite companies who engage in it. It may fall under OHSA 1926.25(a), under housekeeping. If a practice creates a potential safety hazard the rule can be applied to any operation. It’s a generally acknowledged safety problem, and an easily rectified situation. You can’t depend on the common sense of your employees, truckers, or others who deal with pallets. The insurance industry prefers a more modest six foot stack, which works better if you are handling the pallets manually. It’s also recommended that pallet stacks higher than six feet should be protected by automated sprinkler systems (per National Fire Protection Association (NFPA) 13, Standard for the Installation of Sprinkler Systems.). 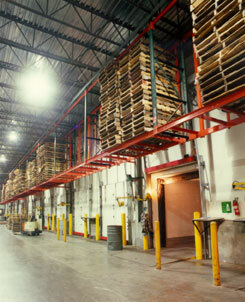 Any pallet storage plan needs to deal with fire code compliance and risks. They aren’t only a falling issue, they are a very real fire hazard. Aside from its 6-foot recommendation, NFPA also offers advice on other issues with fire prevention. 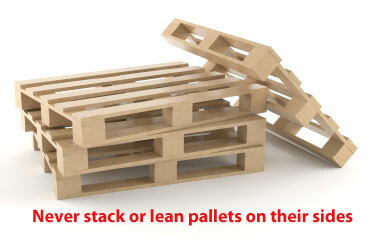 It recommends that pallets should not be stacked within 25′ of other commodities. This makes mixing inventory on racks with empty pallets problematic, as well as other methods like floor storage. 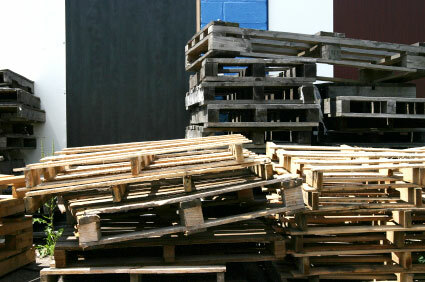 NFPA advises that empty pallets stored outside whenever possible. Plastic pallets are even riskier. Those should be stacked in quantities no higher than four total pallets. It also advises specially designed sprinkler systems for plastic pallet storage areas. 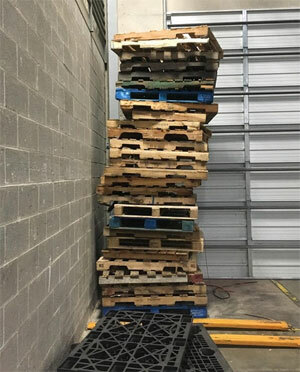 Poor pallet stacking could be characterized as the world’s most dangerous Jenga game; if your pallets are in poor condition, if they aren’t uniform in size, and if they are stacked haphazardly, they can tumble or break. At 55 pounds a pallet, that’s an injury waiting to happen, even if the pallets are in great condition. If they aren’t, 55 pounds driving a bent nail or splintery edge can be even worse. The point: stack them in very straight stacks, and stay at relatively low heights. It’s better to eat a bit of floor space than it is to create a safety hazard. You can also employ pallet stacking frames or stacking racks to help stabilize them. Damaged pallets are inherently unsafe, They are also a factor in product damage incidents. When a pallet is splintered on its ends, it has a good chance of cutting or scraping workers who handle it. When it has protruding nails or fasteners, it’s even more unsafe. If it’s missing boards, stringers, or other components, it can break under a load, or while being transported by forklift. It can tilt or lean while stored in racks. That’s unsafe for workers, and can result in a spilled pallet and lots of inventory damage. NOTE: As with all safety advice on this website and in our literature, this is general in nature, and is derived from what are believed to be reliable sources. Please consult a safety engineer for specifics regarding safe storage of pallets or any other material in your facility. This is an article for informational purposes and may not cover other issues relating to safe pallet storage.